The Institute acquires hundreds of items each year for its library and museum collections. Here is a selection of the most important, rare, unusual or intriguing. Each contributes to the great aim of the Institute—to ensure proper understanding and appreciation of the enduring importance of the American Revolution. Painted portraits of the soldiers who fought for American independence usually depict elegant, attractive men in the prime of life. This oil-on-canvas portrait of a veteran of the Revolutionary War is something different—a somber and arresting view of a poor, elderly man that hints at the financial struggles many soldiers of the Revolution faced after the war. The artist John Neagle painted A Pensioner of the Revolution in 1830, in the midst of the fight for federal pension benefits for the remaining Revolutionary War veterans. Neagle painted two versions of the portrait, which he initially titled the Mendicant. The canvas the Institute recently acquired was first owned by Dr. William Potts Dewees, a Neagle family physician and subject of one of the artist’s most celebrated portraits. 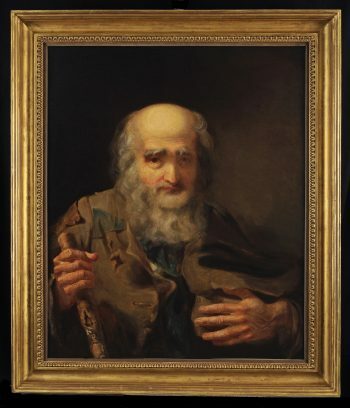 Neagle stated that the subject of the Pensioner was Joseph Winter, a German-born veteran who was living on the streets of Philadelphia when the artist met him. Winter had been a weaver in Bethlehem, Pennsylvania, but had lost his livelihood and family—“a lone wanderer in a world evincing but little feeling or sympathy for him,” as Neagle wrote. The painting attracted great attention in early 1831, when John Sartain issued a fine mezzotint engraving of the work under the title Patriotism and Age. With the sitter now identified as a participant in the War for Independence, Americans viewed the work with both sympathy and outrage, as Congress continued to debate providing pensions to Revolutionary War veterans. One individual declared, “This picture speaks a satire of melancholy truth, that must reach the heart of every American, who is not forgetful of the blessings inherited from his forefathers. It is a burning shame that beggary and scoffing are the lot of those aged benefactors of their country.” Federal pension legislation was enacted in 1832, but it is unknown if Joseph Winter survived to benefit from it. This landmark French map—one of the most comprehensive of the Yorktown campaign—presents the actions, on land and at sea, that resulted in the decisive victory of the allied forces. Titled Carte de la Partie de la Virginie ou l’Armée Combinée de France & des États-Unis de l’Amérique a fait prisonnière l’Armée Anglaise comandée par Lord Cornwallis le 19 Octbre 1781 (Paris: Esnauts & Rapilly, ca. 1782), the map is a prized addition to the Robert Charles Lawrence Fergusson Collection. 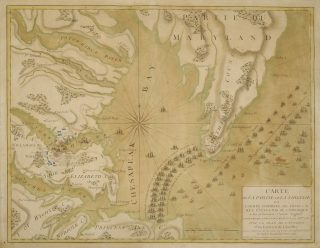 While most American and British maps of the siege focus on the actions of the ground forces and ships in and around Yorktown and Gloucester, this map pulls back to encompass the Chesapeake Bay region all the way up to the Potomac River. It emphasizes, in dramatic schematic form, the key role of the French navy in sealing off the entrance to the bay, trapping Cornwallis’s army on the Yorktown peninsula. Outside the blockade, the British fleet, defeated at the Battle of the Capes, is shown preparing to return to New York, with one of its badly damaged ships, the Terrible, scuttled and in flames. In one of his earliest communications with General Rochambeau, George Washington wrote that, “In any operation, and under all circumstances a decisive Naval superiority is to be considered as a fundamental principle, and the basis upon which every hope of success must ultimately depend.” This map illustrates the fulfillment—and proof—of that principle. Few weapons inspire imagination about the sounds of a Revolutionary War battlefield like a blunderbuss. The name blunderbuss comes from the Dutch word donderbus, which translates to “thunder box”—an accurate description of the surprisingly explosive effect this gun created. A precursor to the shotgun, the flintlock blunderbuss was often issued to cavalry or naval troops for use in close-quarter combat. With a short, large-caliber barrel just shy of fifteen inches and a flared muzzle, the blunderbuss was best for use at short range, to scatter shot or other damaging projectiles. The fine example now in the Institute’s collections is a type that was carried by British troops during the American Revolution. It was made commercially in London, ca. 1770-1780, and would have been purchased by the British government or individual units for distribution to its men. The brass barrel bears two oval London Gunmaker’s Company private proof markings, and the lockplate is marked “TOWER” along with a crown over “GR” next to a broad arrow mark. The tapered wood ramrod terminates in a small metal worm, a corkscrew-shaped tool used to clean the inside of the barrel. This rare mezzotint portrait of the marquis de Lafayette created in 1787 by Charles Willson Peale was recently acquired for the Robert Charles Lawrence Fergusson Collection. 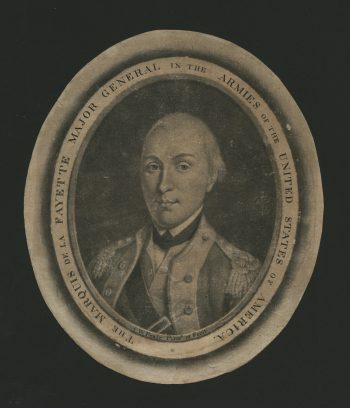 Based on a portrait of Lafayette that Peale painted from life in 1780 for George Washington, the print captures the direct gaze of the young major general at the age of twenty-three, wearing his Continental Army uniform. This print was part of a planned series of mezzotints of “illustrious personages” of the Revolution that Peale undertook in 1787. He produced only four portraits in all—of Benjamin Franklin, Lafayette, the Reverend Joseph Pilmore and George Washington—before moving on to other projects. The Lafayette mezzotint, the second of the series, was completed by April 20, 1787, when Peale sent three impressions of it to Lafayette’s wife, Adrienne, in Paris. Peale offered the mezzotints for sale to the public by subscription in two formats: framed with a double-oval gilt matte for three dollars each, or unframed for one dollar. (In the face of poor sales, Peale quickly lowered the price for the framed prints to two dollars each, while advising his customers the gilt matte alone cost him at least half that amount.) George Washington granted Peale a special sitting for his mezzotint portrait and subsequently displayed it with the prints of Lafayette and Franklin in the Little Parlor at Mount Vernon. In the Institute’s collections, the Lafayette portrait joins the much-celebrated 1778 mezzotint of George Washington by Peale, offering a striking view of these two Revolutionary heroes in their prime, as they were seen by their contemporaries.